Texas has a new license plate. It features the three Crosses at Calvary and says "One State Under God." 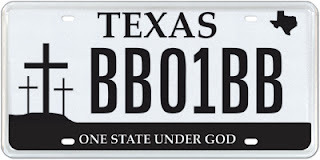 These license plates are made to benefit a Christian ministry in East Texas. Opponents of the plate claim, and rightfully so, that this is a clear and blatant government endorsement of religion. Advocates, however, claim that this is an expression of religious speech protected under the first amendment. The DMV is a public institution. It is completely facilitated by the state. Of course we have the protection of free speech which includes the expression of religious speech. If people wanted to express their religious free speech with the various automobiles, they can use bumper stickers, which many do. Using a license plate, given by the state and for state purposes is a clear violation of separation of church and state. In addition, having the proceeds go to a religious organization makes it even more transparent. The state cannot sponsor a religious organization. Period. It should say "TEXAS ONE COUNTRY UNDER GOD" and just be done with it. Silly Texas. Include the rest of the bible belt and i'll be satisfied. There...i said it.